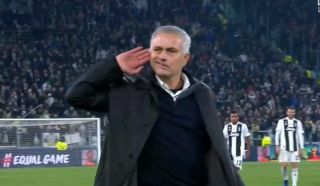 After Man Utd’s win over Juventus on Wednesday night, Jose Mourinho was seen gesturing to the home fans in Turin after he revealed he had been insulted throughout the game. As seen in the video below, the Portuguese tactician certainly enjoyed the dramatic comeback win, and following his previous stint at rivals Inter, there is still evidently some animosity between him and the Juve fans which was also on display at Old Trafford last month. In turn, he would have enjoyed securing all three points in Turin, although Graeme Souness wasn’t particularly impressed with his actions as he criticised him for risking ‘causing a riot’ by inciting the home faithful. While in his defence, he does have a point as Mourinho could certainly have sparked some angry scenes at full-time, there is nothing stopping him from enjoying the moment while also responding having had to put up with the alleged insults from the stands throughout the game. However, fellow panelist Mick McCarthy was quick to step in and reminded the former Galatasaray boss of the infamous incident where he stuck a club flag in the middle of the pitch at rivals Fenerbahce and insisted that neither of them could comment.